If there is one thing I have learned about posting pictures on Flickr, it is that Flickr people love pictures of cats. and Macs. Cats and Macs! 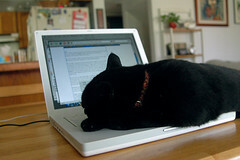 The photo of Blacky & her iBook made it to Flickr’s Interestingness on March 7. How cool! You can do it. They can help.